The Maroon Bells in the Colorado Rockies is a special place any time of year, but especially so in the fall, with the changing colors. The scene is especially spectacular in years when a good dusting of snow is put on the mountain peaks and the storm is not intense enough to blow the leaves off of the trees. But even more special is when all these things come together during a calm and clear night, as was the case on September 28, 2013. 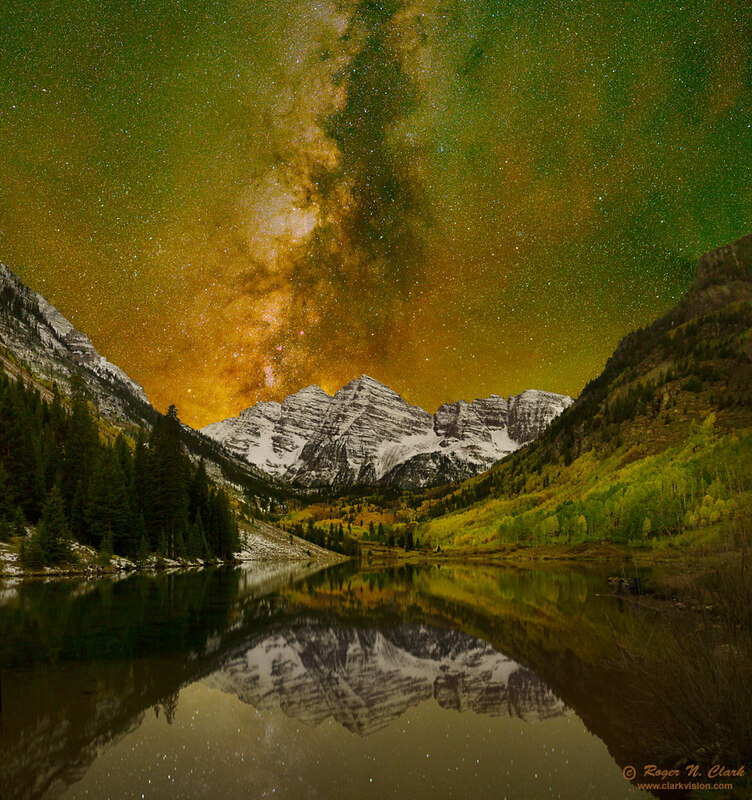 The view of the Maroon Bells and the lake reflection is to the southwest, so only in the fall does the Milky Way show tall over the mountains in the evening. This scene is all natural light. The light on the land is that from the night sky: light from stars, the Milky Way galaxy, and airglow: light from molecules in Earth's upper atmosphere excited by solar ultraviolet light during the day and from cosmic rays. The molecules emit light throughout the night. The green is from oxygen typically 90-100 km high. The red is typically from hydroxyl (OH) 80 to 90 km high. The airglow light is emission line sources, like that from a neon sign. That narrow-band light creates enhanced colors on the landscape, in particular greens and reds in the trees. For more on natural color in the night sky see Parts 2a, 2b, 2c and 2d on Color of the Night Sky and proper post processing to show those colors. Technical. Canon 1D Mark IV 16-megapixel digital camera, Sigma 35 mm f/1.4 DG HSM lens. This is a 29-frame mosaic made at ISO 1600 and f/1.4. The landscape was 2-minute exposures with a fixed tripod. The sky was 30-second exposures, and the stars were tracked with an astrotrac. The reflection of the stars in the lake was 30 second exposures, tracked with the rotation axis changed to follow stars in the reflection. The sequence took 57 minutes to acquire on Sept 28, 2013. The sequence was planned to capture stars near the mountains as quickly in sequence with the landscape to keep the correct orientation of elements in the scene. The full resolution mosaic is 7183 pixels wide and 11,435 pixels high, allowing for stunning large prints. This image is a full-width crop from the vertical panoramic image. Color Balance. This image, and the full vertical panorama version, have gotten a lot of comments, some quite off the mark. For example, "consider changing the tint to more accurately depict what was seen that night (more black/blue than green)." The Earth's moonless night sky is rarely black or blue, especially now at solar maximum. With the red and green airglow emission, as noted above, the dominant light on the landscape from the night sky was yellowish green when this image was obtained. The lake reflection loses some of the yellow and enhances blue due to the index of refraction of water being higher in the blue than in the red, so the color of the reflection will always be different. Also, note the reflection toward the bottom of the image is more brown. That is particularly evident on the left side in the reflection of the pine trees. The brown color is due to light reflected off the bottom of the lake, from the brown mud, and that reflection reduces contrast in the reflected light of the land and sky. In the sky, the Milky way is low in the sky so is reddened much like the sun appears more red when low in the sky. I process my images on a color calibrated monitor using color calibrated workflow. The colors shown represent the correct color tint. Of course I adjust contrast and saturation to make a beautiful image, but if this image could be made on fine grained color slide film, the colors would be similar but more intense and with higher contrast.